You won't need to wonder which foods are okay to feed you little one when he starts solids. The Pediatrician's Guide To Feeding Babies and Toddlers provides practical answers to your questions on nutrition, starting solids, allergies, picky eating and more. You would think that feeding my baby solids would be a breeze. I mean, this is my forth time around. But when my son broke out into hives recently, I decided to go back to the drawing board. None of my kids ever had hives and even though I know that it is a common occurrence in this stage of life, I wanted to make sure I was feeding my little one the right things. I began to eliminate certain ingredients from his diet and it quickly cleared up and hasn't returned. 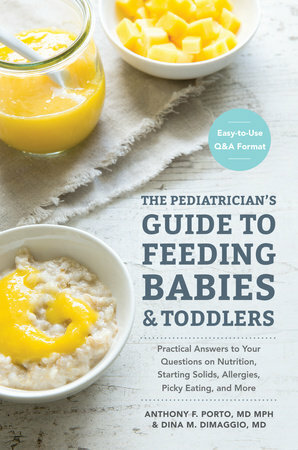 I was excited to refresh my memory with this book as to what kids can eat at different stages in their development. Some information I already knew such as not feeding your child honey before their first birthday. But there were issues addressed that weren't even on the scene when my older kids were this age. For example, those food pouches that are all the rage that you can pick up practically everywhere for your little one. This book discourages the use of those even though they might be convenient since they are devoid of proper nutrition. This book is separated into age groups so you can quickly thumb through to the age of your child and see which foods are best for them at that stage. The book is easy to navigate with plenty of recipes, real life tips, and questions and answers. This book is a useful resource for new and seasoned parents alike. I highly recommend it! Disclaimer: This book was provided by Blogging For Books in exchange for this review.